At Driveway Dumpsters, we routinely provide rubbish and garbage removal service for business, including landlords, real estate agents, estate executors, general contractors, and small businesses. We even work under contract to other trash removal services where one or more of our 10 or 15 cubic yard roll-off boxes can prove ideal. 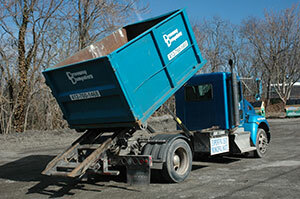 Small businesses undergoing renovation appreciate the 2 to 7 ton capacity of our dumpsters. Call today at 412-760-1468, or use the FREE QUOTE form on this page. Cleanup of small construction, demolition, and remodeling projects. Removing unwanted materials from estates for sale. Debris from the tear down of old decks and sheds. Clean up of waste, garbage, and refuse from business property to prepare it for sale. House clean-outs: removing debris and trash for real estate agents and landlords, when tenants leave a mess. Butchers use our roll-off boxes for disposal of remains during deer season. Recycling available for qualified projects. At Driveway Dumpsters, we’re friendly, fast, and affordable! To learn more, visit our Guidelines, Pricing, and Safety pages. So do it today! 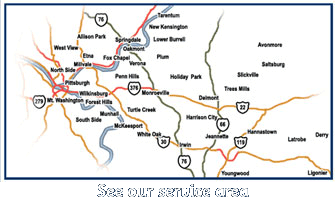 Give us a call at 412-760-1468. Visit our Contact Form, or complete the free quote request on this page. You’ll be glad you did.